EAST RUTHERFORD, N.J. - There occasionally occurs an athletic event worthy of celebration with prosaic laurels crafted to capture the beauty of the moment. This weren't one of 'em. 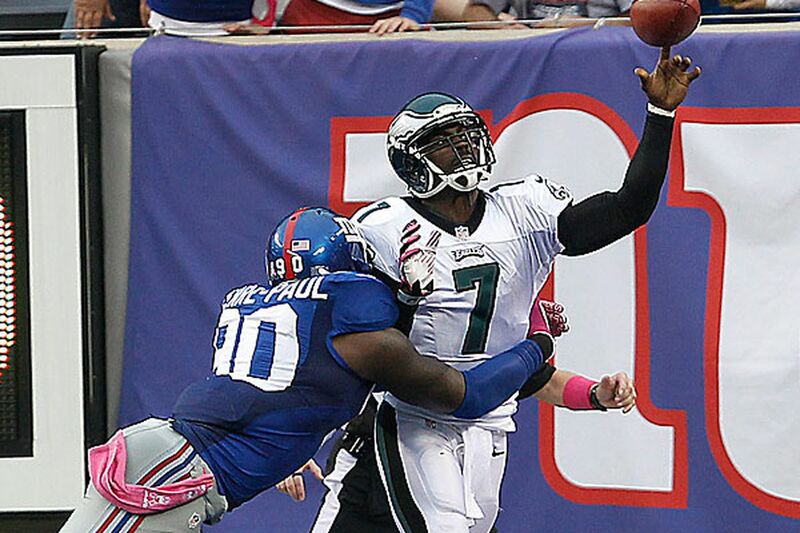 Both the Giants and the visiting Eagles bore accurate witness as to why they entered with one win between them. Lousy defense, errant offense, spotty special teams . . . a shameful display for two proud franchises deep into a viable rivalry. And, really, a display indicative of where they are as franchises. The Eagles won, 36-21. They moved to 2-3, ahead of the 0-5 Giants, ahead, for the moment, of the 1-3 Redskins, the two teams that the Eagles beat. And we use the term "teams" loosely. The Eagles yesterday committed eight penalties for 88 yards, which, combined with their hosts, meant 20 penalties for 224 yards. By comparison, the teams' five running backs managed 113 rushing yards . . . against two bottom-seven rushing defenses. The two starting quarterbacks combined for a 64.6 passer rating. Eli Manning was at 56.1, against the 31st-ranked pass defense in the NFL. The Eagles' special teams committed five penalties by themselves, three of which were enforced. Considering the five field goals, the six sound punts and the good kick coverage, the Eagles' special teams probably were the most effective units on the field. This was lipstick on a pig; pulp fiction, come to life. "There were a lot of plays where the execution was not sound," said Cullen Jenkins, now a defensive tackle for the Giants after two seasons with the Eagles. "The little things weren't getting done." Big things went lacking, too. Rookie right tackle Lane Johnson false-started before the Eagles' first play. The Eagles stopped a Giants blitz and allowed DeSean Jackson to shake a defender downfield, but Jackson dropped the pass. The Eagles defended Manning's first bomb effectively but, on the next play, allowed a 49-yarder to Hakeem Nicks, which set up the Giants' early touchdown. The Giants had the Eagles backed up at their own 37 facing third-and-20, but somehow lost focus on Michael Vick, the greatest running quarterback in NFL history. He gashed them for a 34-yard gain, which led to a 40-yard field goal. Similarly, Manning beat two blitzes and pushed his team well into field-goal range . . . then, while unhurried in the pocket, fell to the ground. And threw the ball. And took an intentional-grounding penalty. This, after wasting a timeout to avoid a delay-of-game penalty; this, followed by a false-start penalty coming off the grounding penalty (the first of three; though the second, thanks to a blown route, was unintentional grounding). Of course, that drive began when, on the kickoff, baffled veteran Brandon Jacobs failed to find anyone to block, and obstructed his returner so completely that the returner collided with him, a la Mark Sanchez. It ended on a lovely punt, which Trumaine McBride had a chance to down at the 1-yard line . . . except it went through his hands and bounded into the end zone. It began a theme for McBride, who had a Vick pass slip through his hands, too, resulting in a 56-yard bomb to Jackson. Yes, these were professional football players. The Giants were decimated by injuries to five starters; the Eagles, by personnel decisions that predate the current administration. Jacobs fumbled, unprovoked; he simply vomited the ball into a scrum before any contact was made. That gave the Eagles three more points. Almost every significant play resulted more from a misplay than from precise execution. And no, that cannot be said of every game; or, even, of most games. This was an egregious exercise in inefficiency. It was the sort of competition begat by players with full knowledge that their seasons will be insignificant; that, no matter how well they perform, they lack the requisite components for real relevance. Just after the 2-minute warning in the first half, Manning dropped a lovely mortar on Rueben Randall, who dropped it. That sequence eventually pinned the Eagles at their 7, facing second-and-10 with 85 seconds to play, when backup Nick Foles replaced Vick. Foles somehow drove the Eagles 75 yards for another field goal. Foles was less successful on the next two possessions, the second of which began with an unprovoked false start on Jason Peters . . . and ended with a 15-yard, fair-catch interference penalty on Brandon Boykin. Asked if there remained work to be done, safety Nate Allen replied, "A lot. We know that. We haven't won a championship or anything." "We won't even look back much on this one," said rookie safety Earl Wolff. "We're still just 2-3." There were a few plays worthy of literary immortality: Brent Celek's touchdown catch in the fourth quarter; Boykin's interception later in the period. But one play in particular crystallized the afternoon for all participants. LeSean McCoy apparently made a tippy-toe, sideline catch to convert a third down in the third quarter. Giants coach Tom Coughlin used a timeout to determine whether he should challenge the play, then put another timeout in jeopardy when he did, in fact, throw the challenge flag. Coughlin's move was sound, since McCoy clearly lost the ball on his way to the ground, and since a reversal would have forced the Eagles to punt. Except the officials did not reverse the call. "I was very surprised when they did not reverse it," Coughlin said. To review: McCoy failed to make the catch; Coughlin lost two timeouts early in the second half challenging it; and the officials blew the replay call. It were that kind of game.